When Kyrgyzstan counted the votes in a parliamentary election Monday, the strong showing of a nationalist party was only one surprise. The bigger surprise was that the results were not a foregone conclusion, making this small, mostly Muslim nation the first in Central Asia to hold free elections in pursuit of a democratic system. "These elections were very successful because they took place at all," said Alexey Malashenko, a scholar in residence at the Carnegie Moscow Center. 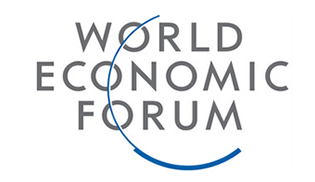 "Kyrgyzstan showed it is an exception in Central Asia. Despite many predictions to the contrary, the elections were held. There was more than 50 percent turnout. There were no incidents. They did it." Serious obstacles still lie ahead as the country that ousted its last president in a coup creates a coalition government and selects a prime minister. And much is at stake in the land-locked country of 5 million people. Some nationalists dislike the presence of a U.S. military base, Manas, which is crucial to the war in Afghanistan. But the base provides stability and money - interests that override political sloganeering. Nearly every American soldier headed in or out of the war zone goes through the base. The surprise in the election Sunday was the 8.6 percent share won by a nationalist party called Ata-Zhurt, or Homeland, a powerful force in the rural southern part of the country, which has been beset by ethnic and political violence. With more than 96 percent of the vote counted, the nationalist party pulled slightly ahead of the Social Democratic Party and the Ata-Meken (Fatherland) party, associated with the north, which includes the capital Bishkek and is the traditional center of power. Altogether, five parties won enough votes to enter the 120-seat parliament, but none got anything close to a majority. They must now start negotiations over a coalition government. This parliamentary system was approved in a referendum in June and is a first for Central Asia, where neighboring Uzbekistan, Kazakhstan and Tajikistan have been run since the fall of the Soviet Union by the same leaders, who unfailingly win large margins in presidential elections. "I was impressed by the political pluralism, the civic responsibility and the spirit of the people of this country," Morten Hoeglund, who oversaw election monitoring for the Organization for Security and Cooperation in Europe, said in a statement. "I have observed many elections in Central Asia over the years, but this is the first election where I could not predict the outcome." 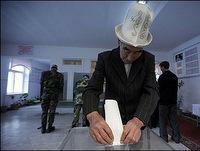 Kyrgyzstan has had two coups in the past five years. Askar Akayev, who was president for 15 years, was forced out in 2005. Earlier this year, his successor, Kurmanbek Bakiyev, was ousted after rioting in the streets. In June, political and ethnic violence erupted between Kyrgyz and Uzbeks in the south, killing 400 people and forcing as many as 400,000 from their homes. 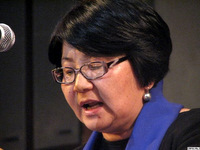 The interim president, Roza Otunbayeva, has been a proponent of a parliamentary system that was presented as a way to give voice and legislative power to disparate groups. It also was seen as a way to bring peace and common purpose to this land, where the mountains divide north and south into two almost separate countries. What otherwise might be local disputes are of enormous interest to Russia and the United States. Both have military bases close to Bishkek that are about 20 miles apart. Russia presides over Kant and the United States over Manas, and when their leases come up for review, talk is often heard against them. "When it is convenient and advantageous," Sergei Mikheyev, vice president of Moscow's Political Technologies Center, wrote in a think tank report, "Kyrgyz politicians hand out any promises to anyone who wants them, just to receive some benefits from this. This has turned into a business of sorts, off which quite a substantial layer of the Kyrgyz upper class is living quite well." Malashenko said, "Believe me, the base in Manas will stay there forever." Now it's time for the messy work of democracy. "How will they decide on a prime minister?" Malashenko asks. "Who will become chairman of parliament? At the moment they are successful, but no one knows how they will negotiate and how they will create a coalition.